Full-length Ramps UK MOT Nut Screws Washers and Bolts (and Grommets) Speedos Terminology Workshop Tools What Year? Full-length Ramps Servicing Bee and Vee was a right pain in the new house this year as I'm not allowed to use ramps, axle stands or jacks on this drive. So all the raising had to be done either half in and half out of the garage, the short ramps slide on the smooth painted garage floor so can only be used on the rougher section near the entrance, but that's narrower, and I had to keep moving the cars to get first one end up then the other. A pal of a pal was getting rid of a nearly new pair of full-length ramps (as he now has a four-post lift!) and they were offered to me for £500. As they were around £1700 new that was something of a bargain. However as they were over a 200 miles round trip away in Hertford it wasn't really feasible to go down just to have a look at the size and try and work out if they would fit in my garage, so pal took loads of pictures and measurements. I pondered long and hard over those, decided they would fit, so the next question was how to get them here. Son-in-law has a van but they were just too long to fit in that, so it meant hiring one. However we were planning on moving some furniture down to my son near St Neots, so a 'two birds with one stone' trip was planned. All went well until we got down to Hertford and I saw just how big all the bits were - gulp! Too late to go back now though, so we loaded them up. Once home I could take more detailed measurements, and realised that to assemble the two ramps and their lifting tube I either needed more width than I'd bargained for, or several beefy blokes to assemble them outside, then carry them in at an angle to get them through the door! However being American they were built for their monster vehicles, and the ramps were intended to be positioned further apart on the lifting tube than I needed for the MGBs. Even positioned as close together as they would go the centre of the ramps is still wider then the centre of the tyres. However it allowed me to chop a few inches off each end of the lifting tube, and I could assemble them in the garage. Each ramp is in two sections so the length can be adjusted as well, but even one of the sections was a struggle to move on my own, and I couldn't imagine being able to move all four of them plus assemble them. So a few days later son-in-law came round and we got them in and put them together. The lifting tube has to be able to pivot up to allow the jack under, and down to allow the vehicle to clear them as it is driven on and off. But unless the ramps were very precisely positioned in all three orientations the tube could be very stiff to turn. But R-ing TFM I discovered the tube should have been greased where it passes through the larger tubes under the ramps! So this time single-handedly I wiggle the one ramp off the tube by dragging each end sideways a bit at a time, then I can pull the tube out of the other ramp. Grease that end, reinsert, grease the other end, then wiggle the first ramp back onto the tube again. Now the tube pivots really easily and is much less dependant on precise orientation. The ramps are lowered both ends when not in use so I can park one of the cars on them, and that 'raises' (ho ho) a couple more issues. Because the entry end is now about 4" off the ground the manual describes how to make a pair of pre-ramps - easy enough. What's a bit more of an issue is lifting the 'blunt' end of each double-length ramp while you position the support tower underneath it - no easy task. I can get a jack under the end (sides won't work as they are too close to the ground) and raise it far enough to get blocks under, then move the jack round to the side away from where the tower fits while I raise it the rest of the way, but that is a bit of a faff. So various Wallace and Gromit devices are being discussed, one of the maddest being a rope tied to the back of the car positioned just in front of the ramps, run over a pulley on a beam, and down to a hook at the end of the ramp - drive car forward, lift ramp, slide tower under. Split the rope and do both ramps at the same time :o) But in the end I settle for a block and tackle attached to a cross-beam conveniently near that end of the ramps. Another slight inconvenience is that my relatively compact jack (I tour with it in the boot of either car) won't raise the lifting tube far enough in one go to lower the swinging legs and lock them in position. I have to jack it part way, then put axle stands under the tube, then slide a block made out of timbers with a sheet steel top under to stand the jack on while I raise it the rest of the way. I've looked at alternative jacks but to get one capable of lifting all the way in one go, but low enough profile to fit under the tube when lowered, is way too expensive for the very occasional use it would get. High enough to get under and work with ease, but not so high I can't reach things when lying on my back. I can only envy Herb Adler his space and 2-post lift ... I think! While Vee was at the paintshop I was able to use a 2-post lift to fit the cross-member and exhaust, amongst other things, and it was really hard work on the neck with my head bent back all the time, and on the arms. I know I'm also reaching up with my ramps, but at least I'm lying down with my head supported and can have a proper rest every now and again, instead of having to stand there all the time. December 2018: I thought I understood the new VHI and MOT exemption from May 2018 until I read December's EMG. That states on p6: "as soon as the car reaches 40 it will be presumed to be MOT exempt immediately from that date". However the Guidance document states "If the vehicle has a current MOT certificate but you anticipate that on expiry of that certificate you will wish exemption from future MOTs you will at the time of relicensing be required to declare that the vehicle is a VHI." which seems to contradict it. On renewing Bee's tax in December, with a current MOT, I was NOT offered the chance to make a declaration. The MOT expires in June 2019, but I won't be renewing Road Tax until December 2019. What happens in the interim when I have no MOT and have not made a declaration? Supposing one were required to present one's documents at a Police Station? The DVLA have confirmed that you will only be required to make the declaration if there is not a current MOT when you retax, and you are covered between expiry and the next road tax renewal when you will be required to make the declaration if there is no current MOT. If you don't make the declaration then the renewal will not proceed. So really the guidance document should say words to the effect of "If the vehicle does not have a current MOT certificate you will at the time of relicensing be required to declare that the vehicle is a VHI." Of course whether one has a current MOT or not, when being used the vehicle must be roadworthy at all times. Hopefully that's the end of it! May 2018: As of 20th May 2018 there are new defect types, stricter rules for diesel car emissions, and some vehicles over 40 years old becoming exempt, see this DVSA document. The full MOT manual can be found here. After much chatter back and fore the upshot seems to be that only the most outrageous modifications involving structural bodywork are likely to be considered a substantial change, as the 'upgrades' typically talked about can probably all come under "changes made to improve efficiency, safety or environmental performance are considered acceptable", including more powerful engines when the emissions are lower. And even then if you don't attempt to declare it VHI and MOT-free then no one will know about it anyway ... except, one presumes, your insurance company for road-going cars. If you do make the declaration then it is taken at face-value, there are no checks. Some of the various pronouncements on what the changes might have meant when first proposed can be found here. September 2010: Michael Beswick found and has sent me this [my comments]: "I was asked by a friend's son what he should check before sending his car for MOT, to avoid it failing on something minor. The list is not exhaustive, and assumes no mechanical knowledge or tools. Just newspaper to kneel on and maybe a pair of rubber gloves! It is also SIMPLIFIED, and makes no attempt to cover items that require equipment to test them or requires knowledge of the testers' manual. Probably takes 15 minutes. "MOTs are a test - the tester may not adjust anything other than Headlamp aim during the test [if you suspect headlamp aim is off then drive to the test centre having removed the headlamp rings yourself, I suggest!]. Certain minor items - such as blown bulbs - can be replaced at the end of the test before the car is passed. Garages may well charge for fitting an item, especially if it is discounting the test [VERY silly to go for a test with blown bulbs ...]. (Currently £54 max but available for £39.95 etc) So it pays to avoid this if possible. Certain failure items must be retested for no fee. Partial re-tests may or may not incur a fee. Details are shown on a poster that MOT stations must display and on the VT30 fail certificate. "Wipers must work, with blades that clear the screen and are intact [clear an arc to give an 'adequate' view, not specified]. Washers +fluid. (push type washer is fine). Windscreen - chips bigger than 10mm in the area in front of the steering wheel will fail: as will bigger than 40mm in the rest of the area swept by the wiper blades. "Indicators left & right. 60-120 flashes per minute is required. "Then put hazards on and all the above, (except indicators) to check that other lights are not "disco-ing" in time with the hazards. "Seat belts must recoil (often slowly! ), unless static type, and lock in place in the buckle. Belts must not be unduly frayed. "Check the tyre tread depth - it needs to be 2mm (1.6mm is the legal min). Check the side walls for bulges or damage. You can't do much about the inside face without lying under the car! "Exhaust must be "supported" - waggle the tail pipe a bit (when cold...) - it shouldn't. Noise is subjective, as it is difficult to determine a "standard" car! "Number plates - lots of regulations. Stick on ones on the bonnet should pass but don't always. 1/1/73 was the change year from metal black & silver to modern yellow/white. Take the V5C to prove date of first registration and/or ask first! "Bits must not be obviously falling off! "Play in bearings, suspension, or steering is beyond the scope of this. If you think headlamp aim may be wrong, remove the chrome bezel before the test to make adjustment easier. If you can see the front brake pads they must be a minimum 1.5mm thick (the thickness of a 5 pence piece). "Local classic car clubs/users can best advise on "sympathetic" MOT stations who understand older cars. High throughput / low price ones probably do not fall onto this category! If you are not sure about a particular thing , take the car in and ask BEFORE the test is due! "Should the car fail, you can drive it home or to a garage to have it fixed [The MOT station may encourage you not to drive the car away on safety grounds, i.e. have it fixed there and then or arrange for it to be towed/trailered somewhere else, but they cannot legally prevent you driving it away]. "Should you have some days "left" on your current MOT but the car fails the test, you still have an MOT, but you are driving an "un-roadworthy" vehicle. The current MOT Pass certificate shows the earliest date at which the vehicle can be presented for test - just under a month before the certificate expires [But see here]. By having the car tested near this date, there should be ample time to fix items that fail. If the car passes, the new certificate is automatically dated for 12 months from the date of the expiry of the current certificate. However if it does fail, be aware that although you still have an MOT, you are driving an "unroadworthy vehicle" which restricts legal use. The penalties are pretty similar to not having an MOT and whilst technically covered by your insurance in legal terms, you are unlikely to have a claim settled. [My son when living in London had no facilities to work on his car and regularly had it MOT'd twice a year]. "I've probably missed something, but it's a start! Good Luck!" For those that have to suffer it, the emissions limits and dates applicable can be found here. Note that there seems to have been a change in rules where later engines are concerned. You can also check the brakes to make sure the pedal doesn't sink under sustained pressure, and if you have a servo 'empty' it by repeated operations of the brake pedal with the engine off until it stops wheezing, then with the pedal firmly pressed start the engine. While emptying the servo the pedal should get higher and harder, then when starting the engine it should sink a little. See also the official MOT Manual from GOV.UK. In addition I spend a few minutes each year under the car, at the annual service before the MOT, just looking around and waggling things, bending the brake hoses back looking for surface cracking etc. November 2011:There are proposals to cease MOT testing of cars registered before 1st January 1960, as well as possibly make testing a bi-annual event for newer cars. One has to ask "Why?" One of the reasons seem to be that owners of 1960 and earlier cars are likely to be enthusiasts and so look after their cars better, but that doesn't follow at all. It's true that pre-1960 cars are 0.6% of the population, and contribute to 0.03" of road casualties and accidents, but that is down to the greater sense of self-preservation of people driving cars of this era. Many cars at the 'lower' end of the classic price scale are likely to be owned by younger and less well-off people, with other cars and families to support, who may well take short-cuts on their pride and joy if they are allowed to. They are equally liable to be owned by people who don't know as much about their cars as perhaps they ought to, as can be seen by some of the questions and comments in the various online communities. Another reason given is that many aspects of the current test are not relevant to older cars - which is true, but in that case they are not tested! It's difficult to see just what could be dropped from the MOT that isn't safety-related. I'm no lover of MOTs, it's taken me 20 years to lose the 'heart in the mouth' feeling on delivering my cars for their tests and getting the verdict. As a Michael Beswick has said, it will only take one child to be killed or seriously injured by a classic car that had a defect that should have been picked up on an MOT, and we might find ourselves under a much stricter regime or maybe even restricted to trailering them to private circuits etc. Nigel Case, owner of the Classic Car Club, is quoted as saying "It’s nonsense. Older cars need more attention. You could buy a car which seems superficially fantastic, but it will be rotten underneath and a death trap." Even less reason for reducing the frequency on cars less than 10 years old, with the first test being at four years. One of the biggest reasons for failure of modern cars is worn tyres, and you can see this in any supermarket car park. Manufacturers have progressively reduced the ownership experience to one of being completely passive, and most people only ever do things like servicing and replacements when someone tells them they have to. The failure rate is increasing - 35% in 2008, 37% in 2010, and 12% of tyres are illegal on replacement. In the current financial climate people are cutting down on servicing where things might get picked up, and the MOT will be the only time that they can be. Despite the above, there are new advisories from 1st Jan 2012 which will be failures from 1st April 2012. That's the list of new and amended items, but before you groan about something like the steering lock on an MGB having to be working as I did (Vee's has never worked in my ownership) you might like to have a look at the full manual. This has new and amended paragraphs and sections denoted by a vertical bar to the left, and in the case of the steering lock it is only to be tested on cars first used from 1st January 2001. There are others, like the new main-beam tell-tale check is only on cars first used from 1st April 1986. One thing that applies to all vehicles is the battery condition and security check - all those who have fitted 'battery bins' or 12v batteries and not bothered to re-engineer the clamps take note! 'Fastener Decoder Booklet' A reproduction of the document produced by BMC in 1964, kindly sent to me by Marc. Whitworth sizes and numbers from Samstag Sales. British Tools and Fasteners, which says it all really (the original link was to The British Tool Company which has been out of business a couple of years. Rask Cycle on bolt head markings and torque figures. Uni-Thread, for taps, dies, reamers and much more. Tracy Tools ditto (funnily enough also in Devon). Abbey Power Tools, which has Whitworth and BA spanners as well as much else. Baconsdozen Imperial Tools, Conversion charts for Whitworth and BSF to mm, AF, BA socket and wrench size equivalents etc. Spanner Jaw Sizes, a useful chart for comparing spanner (wrench) sizes and common nut/bolt use. Conversions from fractional in 64ths to decimal and metric, also useful for comparing spanner sizes. Nuts and bolts can be assembled with dry, oiled or greased threads. From comparisons made with generic sources of information it seems that the figures in the MG Workshop Manual, at least, are probably for oiled threads. Greasing threads can make them liable to come loose. For example I read many years ago that wheel studs should be oiled, not greased. MBG GT V8 Workshop Manual Supplement and Rover V8 Engine Manual. Note that the WSM quotes 17ftlb for 18G and GA i.e. early cars whereas Haynes quotes early models as 25 ft lb and late models as 17 ft lb i.e. the other way round. * Lightly oil threads prior to assembly. ** Coat threads with sealant Part number STC 50552 prior to assembly. There were many different speedos used over the years (I have found 50 so far!) according to year, market and vehicle spec. Secured into the dash with two large 3BA knurled nuts 17H1304 and spring-washers, with a U-strap AJH5176 to September 64, separate 'legs' 17H3744 on each threaded stud from then until July 74, and 17H1339 after that. As well as the obvious physical differences in size and markings the 'turns per mile' (TPM) varied over the years, that is the number of turns of the speedo cable to register a mile travelled. This has to be matched to the drive gearing in the gearbox output shaft, the rear axle ratio, the wheel size, and to some extent the tyre size. Get the TPM wrong and both speed and distance travelled indications will be incorrect. Speed is relatively easy to compensate for by making internal adjustments but to correct the odometer different gear sets are required. The table below has been developed largely from the Leyland Parts Catalogue and Clausager and examination of many speedos at autojumbles, with additional information from other sites such as NAMGBR, Autochart and Paul Tegler. However these other sites either don't include TPM figures, are limited in scope, or disagree to some extent with information from other sources. I am indebted to Ian John of Caerbont Automotive Instruments for supplying me with a list of TPMs for these speedos. Note that speedos not in the list with the exact reference number, even though they have the correct TPM figure, may have different speedo cable fitments, or night-time illumination/ignition warning lamp/main beam tell-tale or fitting arrangements, making fitting them in an MGB not straightforward. 138401 - 332394 Standard MPH BHA4707 SN6144/20 1280* 4"
KPH BHA4813 SN6144/24 800! 4"
Nov67 - Sep68 138401 - 158230 Automatic MPH BHA4707 SN6144/20 1280* 4"
KPH BHA4709 SN6144/21 800! 4"
332395 - 36100 Standard MPH BHA5279 SN6144/20BS 1280! 4"
KPH BHA5280 SN6144/21BS 800! 4"
Overdrive MPH BHA5281 SN6144/23BS 1280* 4"
KPH BHA5282 SN6144/24BS 800! 4"
Canada Nov67 - Jul68 138401 - 153877 Standard MPH BHA4707 SN6144/20 1280* 4"
Jun76 - 1978 410001 - 447000 Both MPH AAU 3027 SN5373/00 1000! 4"
Notes: TPM/TPK MPH speedos have a 'turns per mile' number on the dial, whereas KPH speedos have a 'turns per kilometre' number, and there are 1.60934 kilometres to the mile. Thus a Mk1 car with a 1020/1040/1060 MPH speedo uses the same gearbox components as a car with a 640/660 KPH speedo, a Mk2 chrome bumper with a 1280 MPH speedo has the same gearbox components as one with an 800 KPH speedo, and a rubber bumper car with a 1000 MPH speedo has the same gearbox components as one with a 620 KPH speedo. This means that cars can be converted between MPH and KPH simply by fitting the 'other' speedo. '*' and '!' '*' after the TPM indicates that I have confirmed the figure on an actual example of the speedo and the number has been confirmed by a manufacturer and repairer of the instruments. '!' after the TPM indicates the number has been confirmed by a repairer of the instruments. 1 The Parts Catalogue shows these serial numbers as having the same part number but actual instruments and manufacturers data show different TPMs. 2 Clausager shows Canada and Japan having KPH speedos from 1978, and Canada and Japan 1980 models having 6 - digit odometer, but these changes are not shown in the Parts Catalogue. 3 North American spec including Japan had 4 speedos for 1977 on, probably plastic 'glass' with protruding trip reset button. 4" 85mph speedos with 6 - digit odometer, not in Parts Catalogue. 7 Reads to 120mph, additional kph markings. Figures outside markings, numbers go 10/20/30. 8 Reads to 120mph, additional kph markings. Figures inside markings, numbers go 10/30/50. 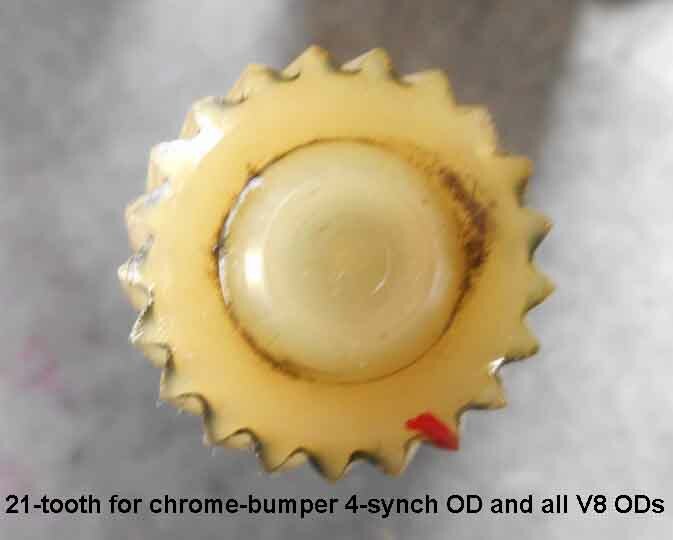 Updated August 2010: Note that 1280 tpm overdrives were used on 4-cylinder chrome bumper cars and all V8s and had a black Laycock label, whereas 1000 tpm ODs were used on 4-cylinder rubber bumper cars and had a blue label. Thus on V8s there seems to be a mismatch between the 1280 tpm overdrive and the 980 tpm speedo, but this is almost exactly counterbalanced by the different axle ratio used on the V8. I needed to get into the mechanism in order to modify the mileage reading. Bee's trip odo has been jamming regularly this year, which made following Tulip instructions tricky. Fortunately the tenths was still going round, so I was having to add that to the main odo reading, then add to that the next inter (distance to the next turn) for the Navigator to write down. Bad enough, but because the trip and main odo aren't in synch sometimes I ended up a mile out either way. I was going to send it away over winter to be repaired, there are a couple of people who can then set any mileage you require (ordinarily it would be zeroed), but at £90 it's quite pricey and they take several weeks to do it. I'd got to the point of investigating how much new ones were for insurance purposes if mine should get lost, when I thought of looking for used on eBay. I found two, one was exactly right for Bee going by the reference number on the dial at £40. The other wasn't a very good picture but from what I could see looked right, at £20 in 'good condition and fully functioning', both mileages way different to Bee's of course. No shipping price in the ad, and you don't get that until you commit to buy which isn't helpful. Emailed the seller asking them to confirm the numbers and shipping price, but had to wait several days for a reply. Not exactly right - it was originally used on 74 models, but specified in the Parts Catalogue as being backwards compatible with earlier Mk2 cars so fine for me, and shipping a reasonable £5. By that time the £40 one had gone, so I committed to buy this one, then had to wait another week or so with no further info from the seller as to whether it had been shipped or not, before it turned up. First thing I did was test it with my drill on reverse, and the speedo goes smartly round, but neither bloody odo worked! Annoying, as the face and the numerals were in as-new condition, and the bezel and glass were no worse than Bee's. I could have sent it back of course, but more hassle and aggro, and no further forwards. So for the sake of £20 I decided to use it as a learning experience and open it up and have a look at it. Same problems with getting the guts out as with Bee's, which I'd already tried months earlier in an effort to see what was wrong with her trip. See the full story here on fixing the odometers on both speedos as well as a description of how they work. Speedy Cables is often mentioned as a source of speedo repairs, but there have been complaints of these taking several weeks. JDO Instruments offers a 48 hour turn round which has been verified by members of the MGOC MGB Technical forum. And now for the question of gearbox drive gears! Whereas for the 3-synch cars the speedo tpms varied between non-OD and OD cars (but by less than 2%) the speedos for 4-synch cars quote the same tpms (1280 for chrome bumper cars and 1000 for rubber bumper) but there are still different part and reference numbers for the speedos according to whether the car was non-OD or OD. This continued up to September 76 and the 77 model year, when suddenly there is only one speedo (different again for the 'new' plastic dash) for LHD and one for RHD, still at 1000tpm as for previous rubber bumper cars, but no corresponding change in gearboxes or ODs. Looking at the parts lists there always were different speedo drive gears and pinions, with different ratios, between non-OD and OD. But whereas the ratio difference is nearly 3% for the 3-synch gearboxes, it is only 1% for the chrome bumper 4-synch (I don't have all the ratio information for the rubber bumper cars). 1% is insignificant (given that speedos in the UK are allowed to over-read by up to 10% but not under-read) so having the same tpms for both is reasonable, but why the different speedo part and reference number if everything else is the same? Even 3% difference for the 3-synch is not that significant in the grand scheme of things, but the speedo tpms for non-OD and OD cars did take this into account. Although even that isn't straight-forward, as the information I have is that Jaeger instruments were 1060 for non-OD and 1040 for OD, whereas the later (1964) Smiths were 1040 for non-OD and 1020 for OD! Whilst the change from crossply tyres to radial may have required a change in gearing, radials weren't available until 1965, and crossplys remained standard on UK cars until 1972. The bottom line is that while changing a non-OD gearbox to an OD gearbox will introduce an error of nearly 3%, on a 4-synch car changing from a non-OD to an OD gearbox of the same era will only introduce a 1% error and can be ignored. the important thing to remember on 4-synch cars is that if you put a rubber bumper OD gearbox in a chrome bumper car or vice-versa, and don't change the speedo, you will introduce an error of around 20% which is very significant. Note 1: Values not known, but if the overall ratio is the same for non-OD as OD (which seems reasonable as the same speedo is used) then the pinion would have 30 teeth. Note 2: Using the same pinion and gear as the chrome bumper LH OD may seem incorrect as the 4-cylinder chrome-bumper car has a 1280tpm speedo and the V8 a 960tpm. You have to take into account the rear axle ratio as well, and the lower ratio of the V8 (prop-shaft turns slower for a given road speed) almost exactly balances the difference in speedo TPMs. Note 3: Label colours are nominal, with MGC having green according to one source, however my V8 is black and Geoff Dunlop's in Australia is green. Ex Laycock people at Sheffield Overdrive Services have told me that if they didn't have the right colour available they used whatever they had to hand albeit stamped with the correct reference and serial numbers. 'Starts' refers to the number of threads on the worm gear fitted to the gearbox output shaft (a standard bolt only has one start). The number of starts is another way of setting the ratio between worm gear and cable drive pinion, the greater the number of starts the faster the pinion turns in relationship to the worm gear. This Wikipedia page explains the principle very well and has an animated graphic demonstrating a 4-start worm gear. SC Parts Group has exploded diagrams of all the OD components (as well as the gearboxes) for all the MGB variants. All the pinions and drive gears are priced, implying that all are available. On non-OD boxes the cable attaches after the gearbox proper, which on 3-synch at least is just forward of the removable crossmember, as in this image from Clausager. There appears to be a clip holding it to the tunnel wall right by the clutch slave, then it passes through the bulkhead at the hole in the top of the (RHD) drivers footrest. On OD boxes it attaches further back, after the OD, above the fixed crossmember on 4-synch boxes. It should then pass under the removable cross-member and be supported by a P-clip, however both Bee and Vee have theirs above and cable-tied to the other cables and pipes. In Bee's case the cross-member is the wrong way round so the tapped hole is on the other side. And whilst Vee's is correct, and I could have fitted it in the correct position, where they are is more protected from any rocks, traffic-calming measures etc. and as neither have exhibited any problems in my ownership where they are I've left them be. It eventually passes through the bulkhead as above ...... and from there makes a graceful turn up and back into the RHD speedo head. There is also the question of right-angle drives. The Parts Catalogue indicates that all cars had one at the gearbox end (13H 2567) to allow the cable to run straight (more or less) alongside the gearbox as it travels forwards. However neither of my 4-synch OD cars has one, the cable makes a neat enough turn through 90 degrees here. There is also the point that the large bulge of the (LH-type at least) OD immediately in front of the speedo cable connection makes a right-angle pointless as the cable would have to go up into the tunnel and then make a tight turn forwards, or even worse go downwards and risk damage, it can't go anywhere near straight back. On non-OD 3-synch gearboxes the cable is connected in front of the removable cross-member and the narrower casing here as well as being angled backwards slightly with a right-angle drive allows the cable to travel forwards alongside the gearbox. However on non-OD 4-synch gearboxes the connection is much closer to the main part of the gearbox, which is wider, and it is also angled forwards, which also prevents the (sensible) use of a right-angle drive. What about the speedo end? The Parts Catalogue indicates one for the speedo as well (BHA 4794 initially, then the same 13H 2567 as for the gearbox for 77 on) for North America, Sweden and Germany from chassis number 187211 to 282419 and apparently all 1977 and later cars. Clausager dates these from the start of the 1970 model year to May 72 when he says it was discontinued. It would have been needed where the cable came up into the right-hand footwell as for RHD cars (which is at the top of the clutch foot rest) then across the car behind the dash. This would have resulted in too tight a turn behind the LHD speedo in the limited space available, hence the second unit. A number of people with LHD cars have said their cable comes up past the RHD entry point, across the engine compartment at the heater shelf, then in through the bulkhead in front of the driver direct to the speedo, rendering a speedo head right-angle drive unnecessary. This includes 3-synch cars using the large hole under the hinge slot, although Clausager appears to show a 74 car routed in this manner but using a smaller hole further above and towards the centre of the car than the large hole (which contains the heat control cable?). The question is what happened on LHD cars prior to the 1970 model year? Did they run across the bulkhead in the engine compartment like post-May 72 cars and hence not need one? If so it seems odd that they then brought it inside the cabin for two years, needing a second drive, but to a different number to the gearbox one. But this 1968 model has the cable brought inside the cabin in the right-hand footwell, and has a right-angle drive on the speedo. North American rubber bumper cars had an EGR valve service indicator which was a warning light triggered every 25,000 miles. A resettable counter intercepted the speedo cable, and was positioned on the heater shelf as shown here on Bill Etter's car. The warning light was illuminated each time the car was started as a lamp test facility. The service indicator was deleted for Canada from 1976 on, and for the rest of North America from 1977 on. On OD gearboxes the cable attaches further back above the fixed cross-member. This cross-member on 4-synch cars has a notch which together with the connection being angled slightly forwards allows the cable to leave the gearbox at almost a right-angle, the bulk of the curve turning forwards being in front of the cross-member and under the floor. Early cars do not show this notch (Clausager p76), but 3-synch gearboxes with the earlier D-type OD do seem to offer more space to allow a right-angle drive to be used. However if a broken right-angle drive on a non-OD gearbox was not replaced (they are expensive) this may need a slightly longer cable to avoid a tight turn. What year is my MG? Often the question comes up regarding "What year is my MG?" with the early cars. Cars built in 1951, or even 1950 are titled as "1952" TDs, for example. Early MGBs built in 1962 or 3 may be listed as 1963 or 1964s. Owners of early cars are especially urged to know their VIN numbers in order to get the correct original equipment. Why? My understanding of the situation is that the "model year" was an American, primarily GM, invention. In the 1930's GM's chairman, Alfred Sloan began the practice to showcase annual styling changes. Soon, every other US manufacturer followed suit, and the concept of a "model year" starting in the fall of the year started. This system was alien to most European manufacturers, including MG. VW even used their rather stable product plan to their advantage with the Beetle's advertising in the States. The European manufacturers basically updated their cars when required for competitive reasons, and only loosely followed a "model year" concept. MG up until the late sixties was like this, hence the issue with when was it built, when was it sold, what year is it anyway, what do I put on the title? Early cars had model years "designated" by the dealer. It was a world where model years were ingrained into American paperwork registration, and titles (after all, who couldn't tell the difference between a '59 Chevy and a '60? ), but with imports from Europe, well, it was a different story. The dealer typically filled out the paperwork so that a car sold in the model year (October to October) was of that model year, regardless of date of manufacture. What changed that "system" was the safety and emissions regulations which phased in requirements by model years for cars sold in the US. Once that occurred, all the European manufacturers had to follow US procedures for VINs, and linking US-destined cars to specific model years and levels of safety and emissions equipment. Of course, old habits are hard to break, and while I'm sure MG put in all legally required equipment, I've heard how sometimes earlier parts sometimes ended up in the next model year's cars on occasion. So - it's not unusual for cars exported to the States sold prior to 1967 (I think that's when the first safety/emissions laws became effective) to have wildly different dates of manufacture vs. model year on their title, and why after that a system was imposed on the VIN designation. Later cars, therefore, will have their model year "baked into" the VIN regardless of the date for manufacture. It's easy to imagine how MG would have had to have been building the next year's model in late spring or early summer in order to be in showrooms in the U.S. by the fall. Today American car titles are official documents used to identify the legal owner of a vehicle, and are required for selling a vehicle or applying for a Titlemax Missouri title loan. True VINs, including the model year, only appeared on the very last MGBs - those built between June 1979 and October 1980. Before that car or chassis (UK) or serial (North America) numbers of the form 'G-HN5/nnnnnn-G' (for an MG, 1800cc engine two-seater tourer, 69-79 model, built at Abingdon) were used. In the UK a vehicle's 'year' is generally regarded by owners as the date it was first registered, the exception being for inclusion in the 'Historic' registration class and its free annual Road Fund Licence or Tax Disc, where the cut-off date (31st December 1972) relates to the date of manufacture rather than the date of first registration. Clausager refers to 'model years' from 1969 on, which started production in November 1968. Thereafter the new model year could start production at any time from May 1978 (for the 1979 model year) to December 1974 (for the 1975 model year) but was typically August or September. 1974 saw another main change-point in September, for the '1974 1/2' model year cars and the full rubber bumpers. Small changes appeared constantly throughout production, however. The changeover points, listed by chassis/serial number, could be a little chaotic as 'old' parts were used up before 'new' parts were used. Therefore it was common for a car with a chassis/serial number before the change point to have some parts that should only have appeared after the change point, and vice-versa. The only thing that could be said for sure is that, as far as is known, matched items were fitted i.e. you wouldn't get a car with one 1976 headlight and one 1977! MGs made in the 1950's to the late 1970's can be dated by the 'TRIPLEX CODE' etched into or screen printed onto the toughened glass. This also works for any other make using TRIPLEX glass. Note that it dates the GLASS, so is only an indication of the cars age, assuming the glass is original. If you are not quite sure of the year of your car, but the decade is known, just look for dots above and below the TRIPLEX TOUGHENED or LAMINATED logo on the glass. Unfortunately it is complicated by the code system changing in January 1969. T = 1, O = 2, U = 3 and so on. However, if you see no dot (or possibly a dot under a space after the last letter), the year is zero. Say your car is a 1950's MG, then TRiplEX TOUGHENED, with one dot over the 'R' in Triplex, and the other under the last 'E' in Toughened, indicates 'April/May/June 1958'. My 75 GT has Sicursive side glass but a Triplex heated back-light with a dot over the E and one under the G, indicating March 74. The car has a build date of May 1975, so you can see that glass (and quite probably other components) could be hanging round for some time before being used - no Just In Time then! My thanks to Pierre De Rijck of Belgium for questioning this information when he found multiple dots on his windows, as originally the information from Neil only indicated one dot. The additional info came from these Spitfire and Mini sites. However it should be noted that these two differ for 1969 and later for the months of March and April. The former shows the dots over the I and P of TRIPLEX whereas the latter shows then over the E and X as previously. As both sites show only the E and X letters being used in all other cases, I'm tempted to think the Triumph site is in error and have assumed such. Pierre also mentioned his two side windows had different codes. This could have been due to breakage in the past, but in his case the two codes seem to be consecutive months in the same year and so are more likely to be from two production batches rather than one. If LHS and RHS glasses are made, packed and shipped separately rather than as pairs this is more then likely, especially given the apparent gap between manufacture and fitting. Less so if the glasses were shipped as pairs, but still possible if one were damaged or a defect found during the build of the car. I've had to delete the links to the MGOC articles on things like axle clonk repair etc. as you have to be a member to get access to them now. But even then it isn't easy finding them - you have to go to Members Area, Technical Archive, enter search terms and select 'Within Enjoying MG only'. Looks easy written there, but I had to have several goes to get there the first time. Robert Bentley manuals MGB Parts List available online from Moss USA. Other MG models and marques available. John Twist's Tech Tips hosted by NAMGBR, on a variety of topics. US Mechanic EDU brings together the best mechanic training information available in one convenient place. Body Rotator from Skye Poier 'The Instillation (sic) of Sills & Rockers' from Classic Auto Restoration Services. A commercial site but includes 'How to' and FAQs. Hood/top fitting from Washington DC Centre MG Car Club Remanufactured parts from British Motor Heritage Ltd. Brake fluid from Veteran Triumph Register Servo overhaul on a TR6 from Buckeye Triumphs. More lamp/bulb info from Daniel Stern Lighting including FAQs, Tech info and 'How To'. Note that headlamp aiming shows LHD, reverse the images for RHD. Lots of electrics info on the 'The T*****h TR6 Web' much of which is also relevant to MGs. Alternator conversions from Bob Muenchausen. Converting 4-cylinder tachs to V8 from the British V8 Forum. Tach calibration and repair from Mark Olsen's Sunbeam Tiger pages. Includes the circuit diagram of the inductive circuit. Rebuilding a tach with modern electronics from Theo Smit's Tiger pages includes a link to a description of how to modify the inductive tach to work with electronic ignition. Tip from Crane (may work with other manufacturers products) if your inductive tach (64 to 72) doesn't work with your new electronic ignition. Enlargeable coloured wiring diagrams in PDF format from Advance Auto-wire. These differ from the Workshop Manual Haynes Bentley in that associated components are placed together so reducing the amount of wiring snaking about and hence making them easier to follow. Lucas relay info on CRC's TVR site. Lucas Technical catalogues for bulbs, switches etc. MG Engines from the TA to the MGF by Neil Cairns BMC engine numbers from 1952 to 1990 also by Neil Cairns. However the section on Gold Seal numbers doesn't include those for the MGB, for which see here. Rover V8 engine number ranges from Capri Racing. Doesn't actually include the factory V8 MGB (or the RV8 as far as I know) but may be helpful if you get hold of an engine for a conversion. Oil filter study from Russ W. Knize. Engine oil bible from 'The Speed-Trap Bible' by Chris Longhurst. Also see the sections on Snakeoils and Additives. 'More Than You Ever Wanted to Know About Motor Oil ' from The Vintage Triumph Register. Biased towards the makes and grades available in the USA. Another oil filter study from SHOClub More oil info, this time from a British biker, but mostly applicable to cars. Explanations of viscosity, detergency, relationship between gear and engine oil viscosity ratings, synthetics and additives ("Don't!" in this last case). MGB cylinder head identification from Sean Brown's Flowspeed.com, mainly for North American spec engines. A little more MGB cylinder head identification info this time from Paul Walbran Motors in New Zealand. Unleaded Fuel - a technical guide from Puma Racing. Detailed pictures of the HIF6 carb linkage pieces on the factory V8 from British Auto. Several SU fuel pump articles by Dave Dubois. RON MON and PON (American) octane ratings explained from Wikipedia and compared by Mad Mole. Zenith/Stromberg water choke by Rick Jaskowiak. And for a picture of a manual choke conversion click here. SU/Butec carb data from Peter & Rita Forbes' Engine Webpages. 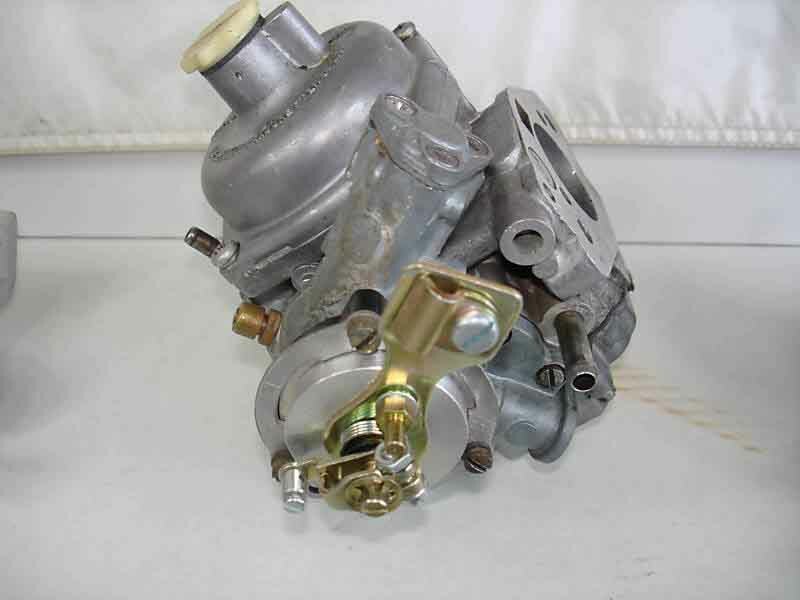 SU carb and fuel pump parts from SU Burlen. Includes spec data on things like piston springs. 'Minty Lamb SU Needle Compare-o-rama'. Shades of Wallace and Gromit, but it is an on-line SU needle comparison and selection program. Theoretical Top Speed calculator from mySportsCar. Modifying the rear crossmember to give improved access to the gearbox mount bolts. NB: Not sure if this is strictly necessary if you attach the crossmember to the gearbox before you raise the cross-member up to the chassis rails. More distributor info from Doug Jackson's 'British Automotive'. Even more distributor info from TDC Engineering many Lucas serial numbers not just MG. Yet more distributor info from AutoChart Inc. Tuning (as opposed to 'setting-up') Lucas distributors also from TDC Engineering. A problem and solution when installing electronic ignition systems. Product information for the 123 electronic distributor. For installation and technical data see here. Transpo supply the electronic module for the 45DM4 distributor. Select 'Ignition Modules', 'Delco', and it is the DM1906. Original-spec advance springs, yes advance springs, from Distributor Doctor, although unfortunately only for 25D and not 45D. Other springs available if you can quote dimensions, also all other distributor parts and a rebuilding service. Tyre sizes and axle ratios from Skye Poier's 'The MGB Experience' site Tyre sizes and axle ratios from Scott Galaba's BMW M Coupe and Z3 Coupe site. Solent Wheels, who apparently make a good job of refurbing V8 wheels where the chrome is peeling. They powder-coat the whole wheel silver, then top-coat the alloy with satin black, and polish the areas round the cut-outs, all for £50. I understand they split the centre from the rim and re-rivet in the process. My local wire-wheel rebuilder - Phillips & Son, Unit 3, Seven Stars Road, Oldbury, West Midlands, 0121 544 9060, just a couple of minutes from J2 of the M5. 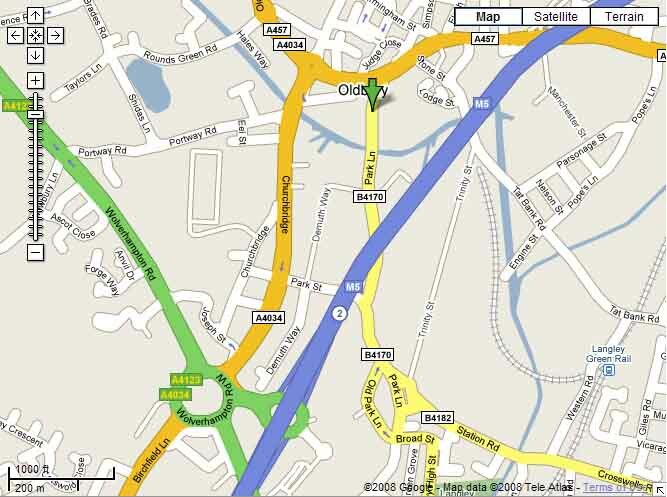 The map (click the globe) has the green arrow close to where they actually are between the canal bridge and the A457, even though that is shown as Park Lane and not Seven Stars Road. Central Wheel Components. They can make stainless spokes to fit MGB wheels for you to fit but do not work on the wheels themselves, only motorbike wheels. Highly polished they are close to chrome, but are said to resist breakage better. Weights of many wheels, probably all after-market. British Wire Wheel - based in the USA despite the name. Sell both Dunlop and Dayton so a useful price comparison. If you know of any sites containing technical information that you would like to see listed here (including your own of course) please mail me with the URL.